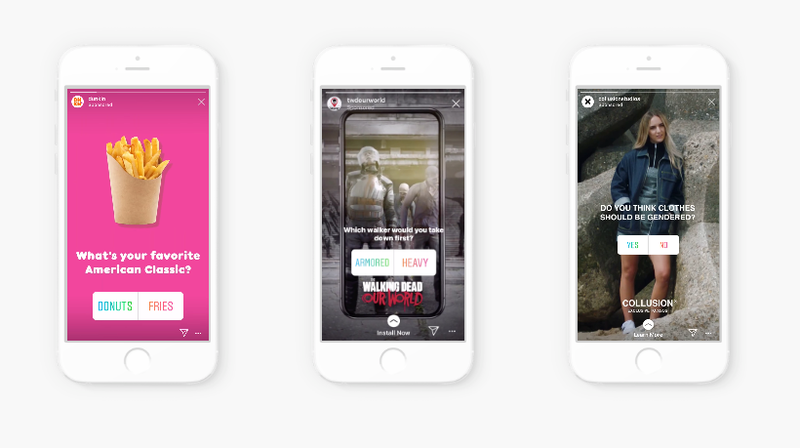 Instagram has announced that it has added interactive elements to adverts that make use of the Stories format. Advertisers can now add polls and sliders to encourage people to interact with their adverts, much as they do in the normal non-advert Stories format. Over 500m people worldwide are interacting with Stories every day. This presents a huge opportunity for businesses to tap into a large audience with a format that is both native and popular. And the proof is in the pudding – 60% of brands are already using Stories, with this number growing all the time. These new interactive features will present a great way of encouraging engagement, and promoting better connections with potential customers. Instagram has conducted a number of recent tests with a global audience. In 9 out of 10 cases the advertisers saw better results by including interactive elements. How could I use this format? 👍 To engage and include: People like to interact with brands. You could include your target groups in the development of new product lines, or service development. These groups will then feel more involved and have greater loyalty to your brand. 📈 For market research: This could allow you to gain insight from your target customers. You could pose simple A or B choice questions such as ‘which dress do you like best?’, or ‘which film do you like best?’ It could provide an accessible route to market research. You could access hard to reach cohorts of people, such as Nascar enthusiasts in Nairobi, botanists in Botswana, or unicyclists in the UK. All you do is simply select your target group and serve them an ad with your desired question. This can be done from anywhere in the world and will be much cheaper than hiring market research companies. 😏 To create future custom audiences: In the future this feedback could be incorporated into the ad strategy, hopefully allowing the creation of custom audiences. For example, you’d be able to market specifically to people who gave a certain response to your interactive advert. How can I add interactive elements to my Stories ads? If you’ve got access to this feature, when you start designing your ad creative you’ll see an to add interactive elements. Hitting this button will allow you to choose which interactions you want to set up. If all of this feels a bit complex and scary, why not come along to one of our Facebook & Instagram Advertising Courses? You’ll not only leave the training with a live campaign, but the knowledge to do it again and again. Give someone an advert and they’ll profit for a day.